Joe McKeown directs his team from the sideline. The experienced coach is scheduled to receive an award for surpassing 600 career victories. A successful season has been capped with postseason honors for Joe McKeown, as the coach is scheduled to receive a Women’s Basketball Coaches Association (WBCA) Victory Club award Monday at the WBCA Awards Show. The award is presented at the end of each season to coaches who achieve milestones of 200 wins or greater, in 100-win increments. McKeown qualified by earning his 600th career victory on Nov. 21 against his alma mater, Kent State. 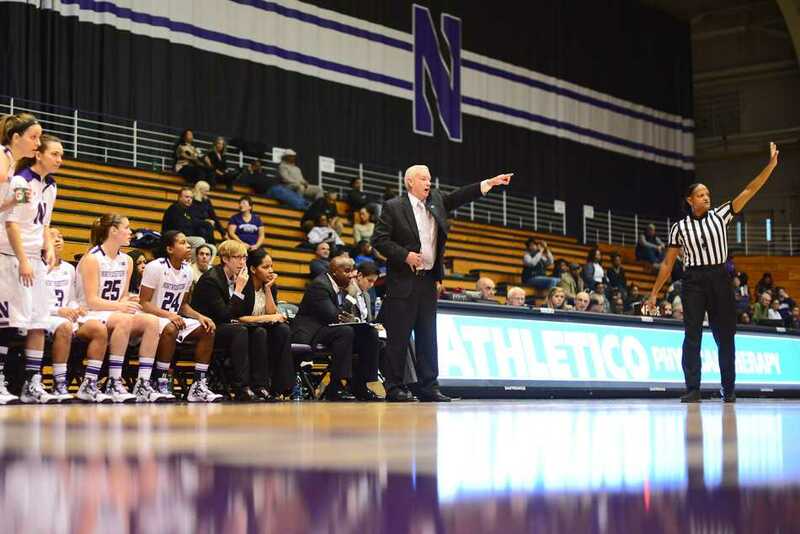 The veteran helmsman guided Northwestern to a 23-9 overall record and a 12-6 mark in conference during the 2014-2015 season en route to a seven seed in the NCAA Tournament, the first such berth in McKeown’s seven-year tenure. The Wildcats lost in the first round of the Tournament to tenth-seeded Arkansas, but the campaign still marks the most success McKeown has enjoyed since coming to NU. The team also achieved a ranking in the Associated Press poll and had two separate winning streaks of at least eight games.